Self-propelled, radio-controlled machine for the filling of artificial turf. The SandMatic B1505 fully meets the special demands placed on it by ultra-modern artificial turf surfaces and even when the pile is extremely high the prescribed amounts of sand or granulate will be exactly distributed and worked into the system. A slide valve enables the quantity of material strewn to be constantly variable from 2.5 – 40 kg/m². 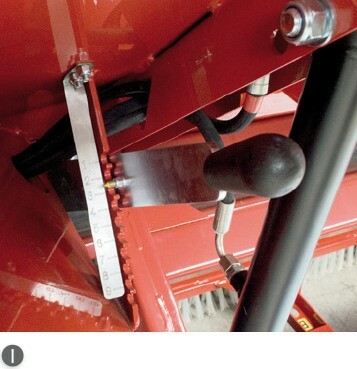 Driving speeds from 1 m/min to 15 m/min make the machine flexible in use. With the working width of 1.5 metres, theoretical performance of the machine ranges from 1.5 to 22.5 m²/min. The machine is driven by a 3-cylinder Kubota diesel engine with integrated hydraulic cooling system with a performance of 18.4 kW (25 HP). 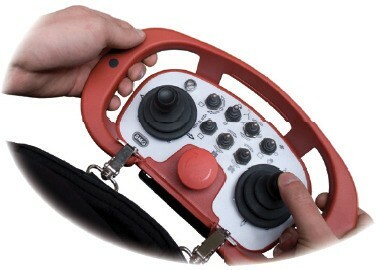 All functions can be controlled by hand. This makes the operation method more convenient and expedites the working process. 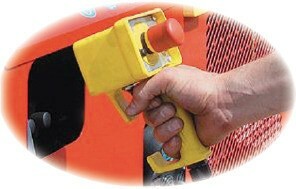 The machine can be also controlled manually by means of the operating panel. The weight of the machine is supported by 8 air-filled, low-pressure tires. That way, the machine, when filled, conforms to the permitted ground pressure for the synthetic surface. The four pairs of wheels can be pivoted through 120°, which makes it extremely easy to manoeuvre.